Lamy Rheology announces a new design for the TX700 Texture Analyser. 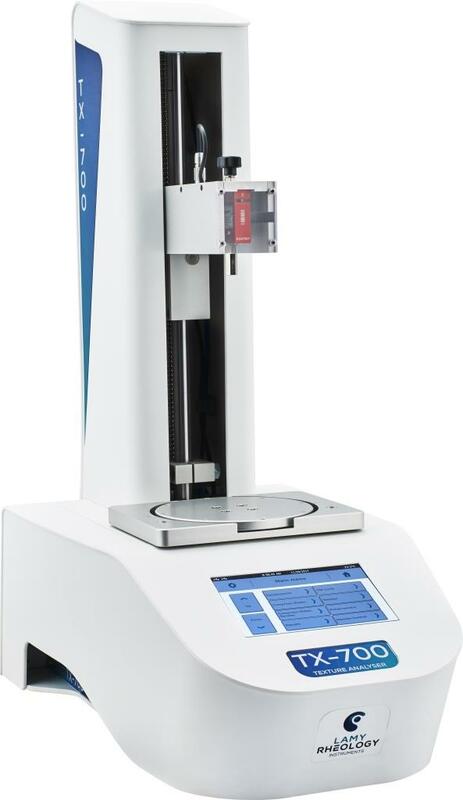 The TX700 is the first Texturometer that enables curves to be viewed during measurements without the use of external software. TX700 Texture Analyser is Ideal for measuring the consistency, elasticity and stickiness of many food products. The TX700 is able to monitor the temperature using a Pt100 sensor during sample data acquisition. It is available with a choice of interchangeable load cells ranging from 1 kg to 50 kg. Lamy Rheology offers a wide range of industry standard measuring probes. Operating modes include; compression, relaxation, extension, TPA Cycle, penetrometry and relative compression. It has a 160mm integrated adjustable turntable, 7” touch screen and microprocessor store for methods and data. TX700 Texture Analyser is robust, versatile with and competitively priced and is essential in quality control and/or R&D in all aspects of food processing, cosmetics, surface coatings and teaching.